If your deck is less than 30 years old, you should never have to replace any part of it! Call (708) 354-2337 now to schedule your free deck inspection and quotes! Can you really make MY deck look like new, how long does it take, how long does it last, and how to do it with the least of your effort at the lowest possible cost? Do I need to replace anything or everything and how long will it last? How to prevent chipping, cracking & peeling of my decks surface? Why most sealers & stains you’ve been told to use are actually ruining your deck and the #1 sealer to use that won’t. How to remove all splintering and keep it from coming back? The best and lowest cost way to maintain the deck so its mold, moss & mildew free looks the most natural and lasts the absolute longest. How to prevent the need to replace boards (Or your whole deck) from now on. The fastest way to turn that ugly old greyed out deck into fresh looking wood again. Our commitment to providing top-notch services to Hinsdale and surrounding area offices and homes is what makes Haugland Brothers deck cleaning your number one choice. Haugland Brothers Carpet & Floor Care is a quality provider of a multitude of cleaning services. This includes helping keep your outside deck or porch looking just as lovely as the day it was installed. Your deck will glow again once our team of deck cleaners has had our go at it. Give our offices a call today and schedule a first rate deck cleaning that gets rid of that worn look and breathes new life into your outdoor spaces. When it comes to prolonging the life of a deck or porch, no one does it better then the Haugland Brothers team! Haugland Brothers has been proudly serving homes, offices, and business all across Hinsdale for years. We have built a solid reputation in a number of Chicago communities with our strong work ethic and superb results. It is our commitment to quality that has made us the premier deep cleaning company in all of Chicago. Our full range of services are always priced competitively and customized to suit projects big and small. Whether you are just looking for a spring clean-up for your outside deck, or want a complete restoration, we are equipped to take it on. Call us now and see for yourself why when it comes to a deck that looks good as new Haugland Brothers is the company for the job. Making Your Outside Spaces Squeaky Clean! Unfortunately, when it comes to decks and porches, maintenance free does not exist. There are any number of elements that will dirty your deck and the exposure to cold Chicago winter doesn’t help. 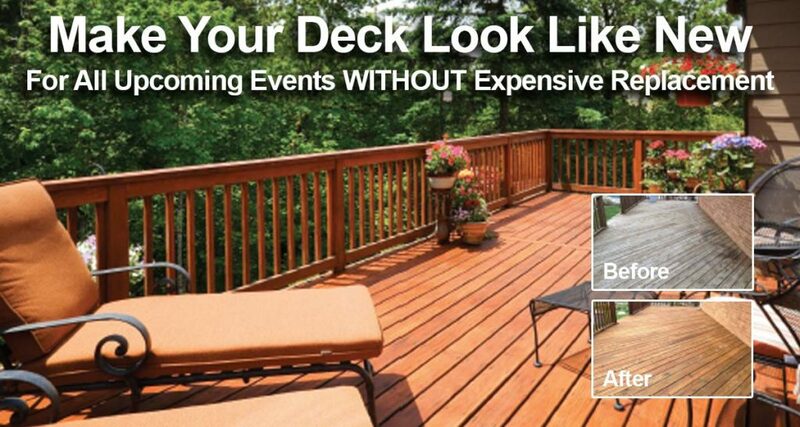 Dirt, algae, mold, and grime will all eventually take over, taking away the shine and turning your deck dull. With our professional cleaning service, the dirt is destroyed and the shine is restored. Clean, Restore, and Protect Your Outside Deck! Using specialized equipment and cleaning solutions, Haugland Brothers will thoroughly clean your outside living spaces revealing a new again look for your deck and porch. With composite decking that may be all you need, but if your home has a natural wood deck, our experts will be on hand to talk to you about your options for restoration and staining products to protect your deck. Why Should You Have Your Outside Deck Professionally Cleaned? The decks and porches gracing Hinsdale homes add value to the property as well as additional living space. If not given regular and thorough cleanings, the elements will soon destroy the look or even the structure. Haugland Brothers knows the exact cleaning system and soaps to use on any type of deck to bring back its shine. You will not get the same results by cleaning a deck or porch yourself, and you may end up damaging it in the process. Haugland Brothers years of experience has taught us precisely how to clean outdoor living spaces to restore their freshness and bring back the glow. Unlike a broom and garden hose, the deep clean we provide will remove any stains in the deck and built in grime and dirt. No surface is left untouched as our expert deck cleaning team meticulously wipes out build up, leaving behind a sparkling clean outside living area. How Often Should You Have Your Deck Cleaned? For best results, you should have all of your outdoor spaces cleaned at the beginning and end of each season. Winter does a number on decks here in Chicago, and can leave the surfaces looking dull. After months of use during the spring and summer, your deck deserves some attention before winter. What Can You Do to Protect Your Deck in Between Professional Cleanings? You can hose most decks down on occasion, but that will not provide you with the same deep cleaning that Haugland Brothers offers. During off seasons, keep it covered (if possible) to avoid overexposure to moisture from snow. Our experts will give you professional tips on the best products and techniques to use on your deck depending on the type that you have. How Important is Cleaning Your Deck? A deck adds unique value to a home. However, being exposed to the elements can make it a challenge to keep clean. Mold and mildew can form quickly, ruining the decks appearance while built in grime will make it appear dull. If you want to keep that investment always looking sharp, it needs to be cleaned regularly. At Haugland Brothers we have have the right tools and know how to get your deck back in a like-new condition. Call us today at (708) 354-2337!